But, to the dismay of many… this will not be a “Cut and Run” operation! US President George W.Bush and British Prime Minister Tony Blair will meet in Washington this week to discuss plans for an accelerated withdrawal of troops from Iraq, starting in July. Reports in London said that in a phased pullout, in which the two countries would act in tandem, Britain would hand over to Iraqi security forces in Muthanna province in July and the Americans would follow suit in Najaf, the Shia holy city. Other withdrawals would follow quickly over the remainder of the year in a much faster and more ambitious withdrawal than expected. The reports came after Mr Blair paid a surprise visit to Baghdad to meet Iraq’s new Prime Minister, Nouri al-Maliki. US and British officials hope Britain’s 8000 troops in Iraq can be cut to 5000 by the end of the year and the US’s 133,000 troops to about 100,000. Iraqi security forces could be in charge of much of the country by the year’s end. Buoyed by the formation of Iraq’s new unity Government at the weekend, senior officials travelling with Mr Blair said all foreign troops should be out of the country within four years. Mr Blair is to hold further discussions on withdrawal at a White House summit with Mr Bush later this week. The AFP reports that Bush and Blair will also urge other nations to show more support to the new Iraqi government. 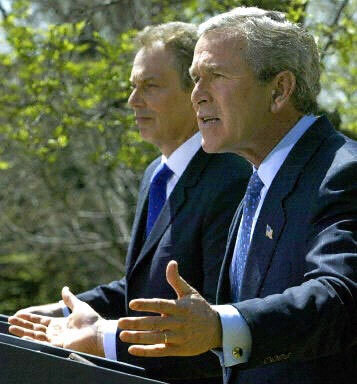 Yesterday, the New Zealand Herald reported that Bush and Blair will defend their Iraq policy this week. The world leaders will also come down hard on the UN during Blair’s trip this week to the US. Boy, it’s going to be interesting to see the reaction to this news! …Does this mean we won? Lori Byrd at “Wizbang” corrects me. She explains when the war was really won.